Topics: Helpful Forms, and Health Info. Its 2 nameservers are ns2.rosehosting.com, and ns1.rosehosting.com. 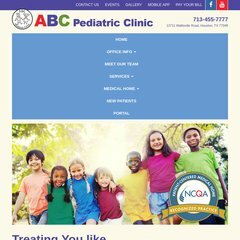 Abcpediatricclinic.com's IP address is 209.135.157.213. It is hosted by Rose Web Services Llc Missouri, using Apache/2 web server. PING (209.135.157.213) 56(84) bytes of data. A ping to the server is timed at 7.62 ms.